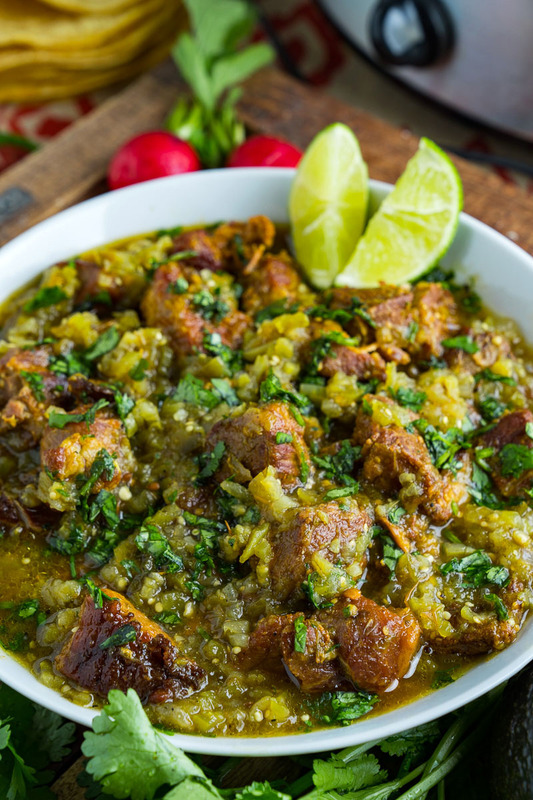 A Mexican style pork stew in a tasty salsa verde that is slowly braised until the pork melts into your mouth! This chili verde is one of my favourite recipes and when I was making it the other day I thought that it was a great opportunity to take some new photos and update the recipe! 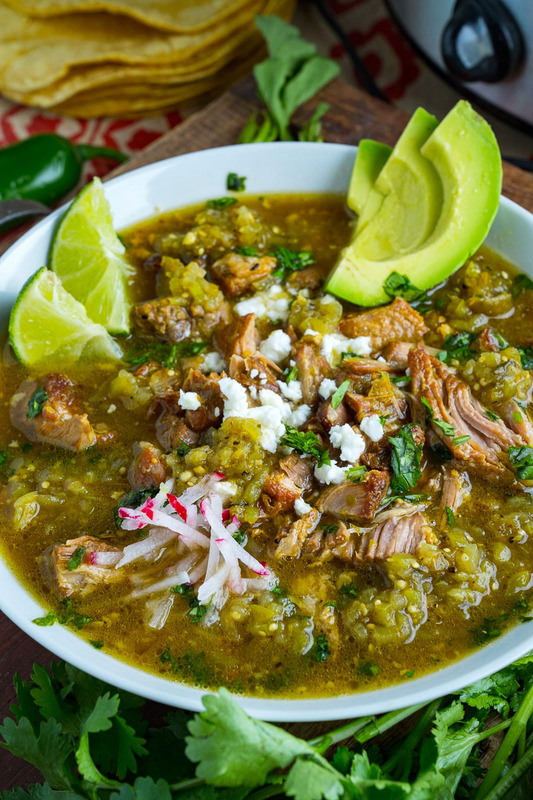 Authentic chili verde is a chili, the dish, consisting of pork and chili peppers, in this case green ones like poblano peppers and jalapeno peppers. The sauce is filled out out with roasted tomatillos, onion, garlic and broth and after the pork is cut into small pieces and browned it is simmered in it until it’s melt in your mouth tender! It’s that easy! 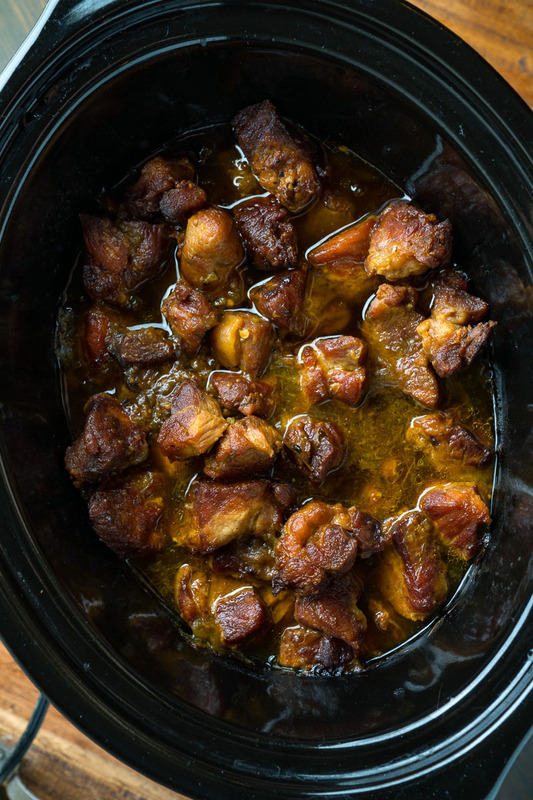 Pork simmered/braised in salsa verde and it’s so good! I like to serve this like a stew topped with garnishes like limes, avocados, sour cream, radish, cheese, etc but it’s also great as a filling for tacos, burritos, etc. 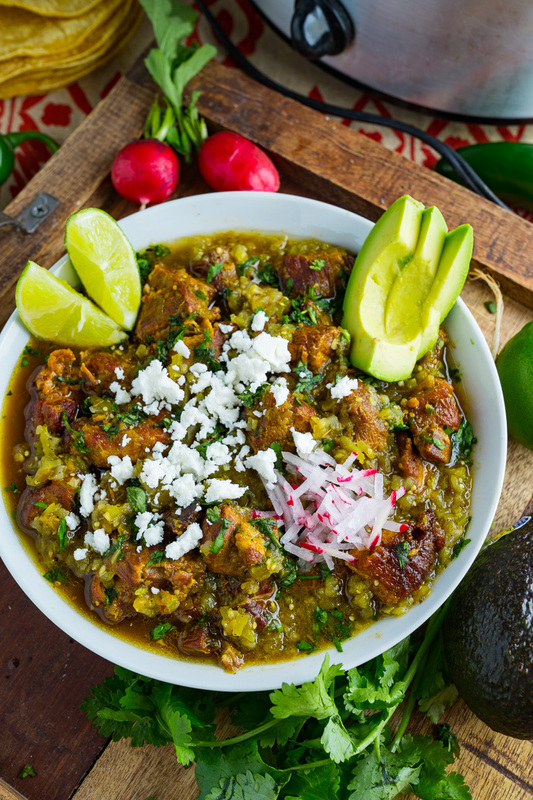 This traditional pork chili verde is perfect for cool fall evenings and any leftovers only get better the next day! 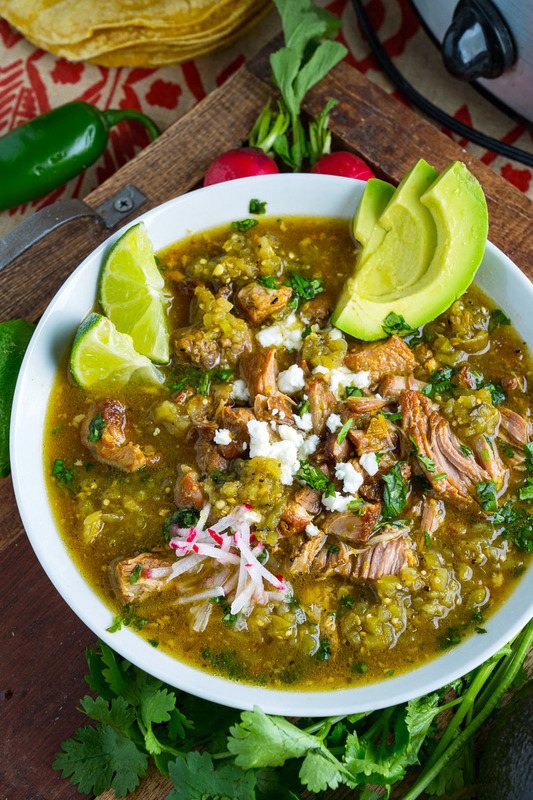 Slow cooker chili verde is an even easier way to go! Place the tomatillos, peppers (cut sides down), onion and garlic on a baking sheet and broil until the skins are all blistered and black before pureeing in a blender along with the cilantro and setting aside. Heat the oil in a large heavy bottom sauce pan or dutch oven over medium-high heat and brown the pork on all sides before setting aside. Either add the broth, cumin, oregano, pork and tomatillo sauce, bring to a boil, reduce the heat to a simmer, covered, over medium-low until the pork is falling apart tender, about 2-3 hour, OR transfer to a preheated 350F/180C oven and roast, covered, until the pork is falling apart tender, about 2-3 hour, OR trsansfer the ingredients to a slow cooker and cook on low for 8-10 hours or on high for 4-5 hours. Option: Serve with your favourite chili topping like, limes, avocado, radish, sour cream, crumbled queso fresco or cotija, etc. Option: Skip step one and replace the first 6 ingredients with 2 cups of store bought salsa verde to keep things quick and easy! Option: Skip step two and use un-browned meat. Option: Blister/char the tomatillos, peppers, onion and garlic over an open flame in in a heavy bottom skillet over high heat instead of broiling. Option: Add a ham bone or use ham broth to kick up the pork flavour! Option: Save half of the tomatillo salsa and place it in the stew after it has simmered so that it retains a bit more of it’s green colour. Option: Mix in a pureed avocado just before serving to thicken the stew and make it creamier! Option: Add potatoes or white beans to make it even heartier. Option: If you want more of a soup, add more broth if you want more of a stew, cut back on broth. Option: Shred the pork. (Further Option: Use the shredded pork in salsa verde as an ingredient in other recipes like tacos, burritos, quesadillas, etc.! Note: The flavour improves with time so the leftovers will be even better. Kevin, that’s simply perfect! And it will taste better and better as the days pass. Yum! Chili peppers are so confusing! I searched the web a bit more and found this photo with chilies that look just like the ones that I used (the ones that my grocery store has labeled as “Green Chilies”): chile de arbol. To me that looks delicious, but I am laughing because I can just about picture my kids faces if I tried laying a bowl of that down in front of them… but its GREEN! Kevin, that’s such a terrific recipe. Love the combination of flavors that you’ve got happening in there. Kevin, I was just re-reading your about me and realise that that will soon need to change because let me tell you, your meals are no longer boring. I’m sure what was happening before you started blogging but let me tell you, boring your meals are not! Chili does get better as the days pass. Its a shame that the pot gets emptier as well. Salsa verde on huevos rancheros sounds good. I have certainly fixed my boring meals problem. Other than left overs I don’t think that I have really repeated a meal since I started this blog. It seems that I will have to update my About Me section sometime soon. I found this recipe just last week– and made it last night for our church's chili cook-off! Thanks for the great recipe! Your link to green chile de arbol was the first time I'd ever seen them in a green state! Thanks for the education 🙂 In the U.S. anaheims are the mildest form of common chile pepper, it's what "canned" or "diced green chiles" in recipes is *always* referring to, in U.S. recipes. Poblanos are great big hulking things somewhere between anaheims and jalapenos in heat. So when do you add the pork back into with the rest, because i know just browning it, isn't going to cook it all the way through. Do i add it in when its time to simmer??? Styna: Yes the pork is added with the rest of the ingredients for the simmering. The two chilies you mentioned in your note are really very good and more consistent in heat – as nearly everyone knows that sometimes a jalapeno is not hot… Poblano peppers are often charred to bring out flavor and it you have a gas stove this is easily accomplished by setting the pepper on the burner and turning it own low. They would be worth looking for and trying them out. Anonymous: I like to add charred poblanos when I can but they are not always available here. I have more consistant luck getting the green jalapenos and the green cayennes. Too many jalapeños for us. We used Hatch chiles. And instead of a pork lion, I used a pork sirloin. Turned out fine, the meat shredded up. Great on rice. I’m curious about one step. Usually when I char peppers, the black is peeled/scraped/rubbed off before adding the peppers to the recipe. I don’t see many flecks in your photos, but don’t see a step to remove the blackest of the char, either. Does this mean it’s more of a dark oven roast on the veggies and tomatillos? 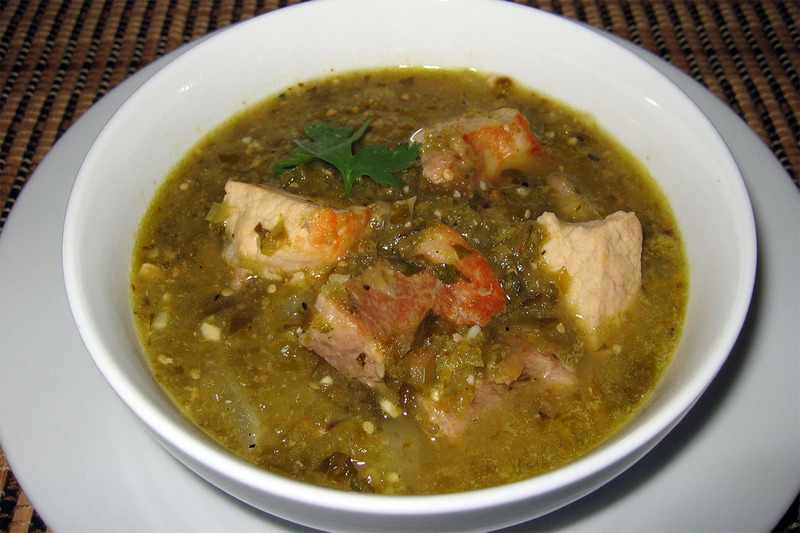 This recipe looks amazing, and my son-in-law loves chili verde. We live in San Diego, so authentic, delicious Mexican food is easily found. Your recipe has inspired me to expand the Mexican dishes I make at home. I found your blog a few years ago, and LOVE your creations!!! Thanks in advance for the clarification regarding the char. Kevin, I’d love to try using the toasted and ground cumin seeds but can’t find them where I live. Would you use regular cumin instead, and if so…how much? If you cannot find cumin seeds, you can use pre-ground/regular cumin at the same amount (1 teaspoon); you can also omit the cumin. Enjoy! My mouth is literally watering. My family would love this..
Just made this using frozen roasted tomatillos from last summer’s garden and it was absolutely phenomenal. The fish sauce is an ingenious touch!